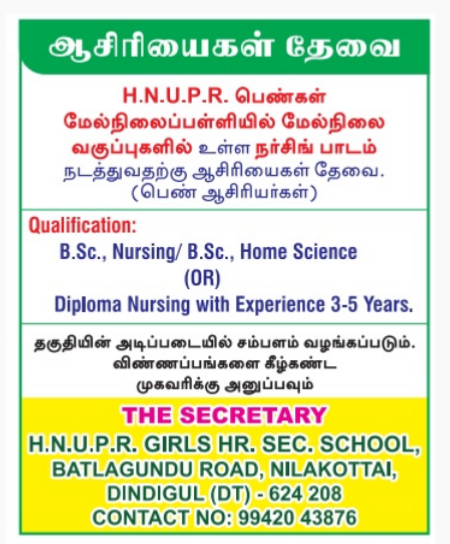 H.N.U.P.R Matric Hr Sec School, Dindigul has advertised in THE DINAMALAR newspaper for recruitment of Nursing Teacher jobs vacancies. Interested and eligible job aspirants are requested to walk-in immediately. Check out further more details below. About School:HNUPR.MAT.HSS NILAKOTTAI was established in 1972 and it is managed by the Private Unaided Management. It is located in urban area . It is located in NILAKKOTTAI block of DINDIGUL district of TAMIL NADU. The school consists of Grades from 1 to 12. The school is co-educational and it has an attached pre-primary section. It has got 9 teachers for pre-primary section. The school is non-residential in nature and is not using school building as a shift-school. During the previous academic year; the school functioned for 210 days. It had no academic inspection and was not visited by the CRC and BRC Coordinators during the previous academic year. Â English is the medium of instructions in this school. This school is approachable by all weather road. (b) Diploma nursing with experience 3-5 years. How to Apply: Walk-in Interested candidates are suggested to appear for walk in Interview. Reference: Advertisement on THE DINAMALAR Newspaper dated on 24th May 2018.